The Seattle condo market experienced another phenomenal year of growth in 2016, both in terms of units sold and values. The number of condos sold in Seattle proper increased 18.9% in 2016 to 3,625 units compared to 3,050 units in 2015. Interestingly enough, new construction sales added approximately 630 units between the Vik, LUMA and Insignia last year. 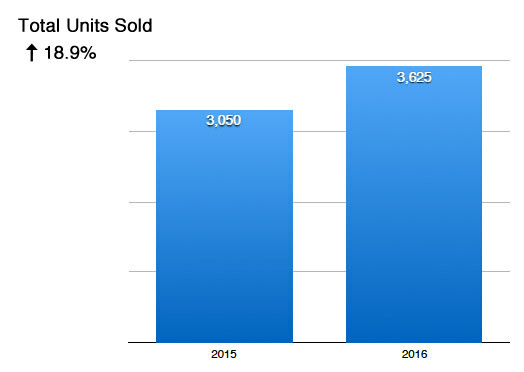 So, the number of resale units sold was just slightly less than in 2015. Seattle accounted for 43% of all condo sales in King County. The Seattle citywide condo median sales price rose 16.7% in 2016 to $408,500, again thanks to the new construction sales. Excluding new construction, the citywide median would have been $370,000, reflecting a more modest 5.7% increase for the resale market. The average sale price was $512,680. The median condo sales price for King County was $326,000. 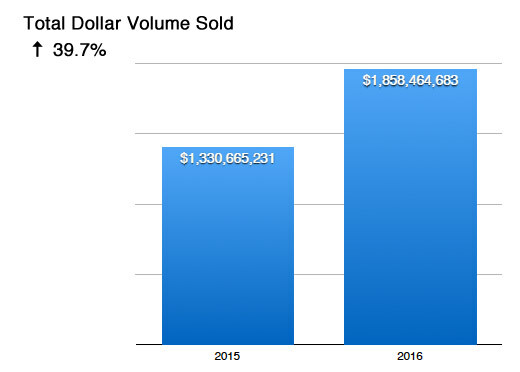 The total dollar volume of Seattle condo sales skyrocketed 39.7% last year to $1,858,464,663. New construction sales contributed approximately $560,000,000 towards that volume. Note: townhomes developments structured as condominiums are included in that figure. The total dollar volume of condo sales for King County was $3,397,108,967. 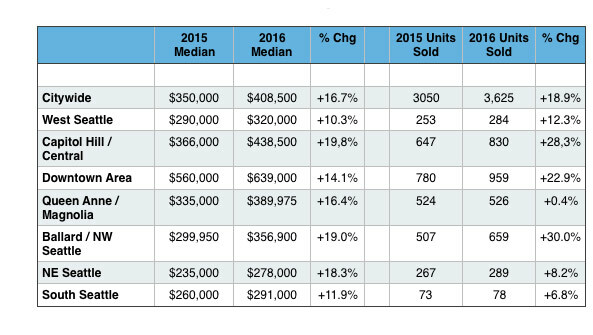 The areas with the largest increase of units sold reflected new construction sales (Vik in Ballard, LUMA on First Hill and Insignia in downtown). The number of units sold in 2017 will decrease since we have far fewer new condos completing this year – less than 150 – and I predict fewer resale units will be available as well, resulting in an even tighter market than we experienced last year.